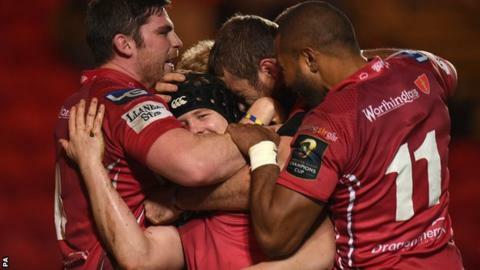 Scarlets climbed above Ulster to move off the bottom of Pool Three with a 22-13 victory over the Irish province in the European Champions Cup. The Welsh side led 12-0 at half-time through Rhys Priestland's boot in wet and windy conditions. Ulster cut Scarlets' lead to 15-13 courtesy of Darren Cave's try and kicks by Ian Humphreys and Ruan Pienaar. But James Davies' interception try sealed the win after Pienaar missed a late penalty. They are now second in the group, two points above Ulster and level on points with Leicester, but five points behind leaders Toulon with two games to go. Ulster coach Neil Doak had hoped his side could follow up their 24-9 win against Scarlets in round three. But the Welsh side adapted to the conditions better early on, although both teams seemed content to kick the ball back and forth to each other for large spells of the first half. Scarlets took an early lead when Ulster won a line-out near their own line but were penalised for holding on to the ball and Priestland slotted the penalty. Just a minute later the Irish side were presented with their first and only real attacking opportunity of the half, as Scarlets' centre Scott Williams knocked on inside his own 22. But the home side's scrum held firm under pressure and forced a penalty from which Priestland cleared. Scarlets dominated possession and abandoned their kicking game when in the Ulster half, going through the phases with ball in hand to force penalties and enable Priestland to kick them into a 12-0 lead at the break. Ulster's first sustained attack with ball in hand paid dividends after just 90 seconds of the second half as Luke Marshall exchanged passes with Cave, who sliced through the Scarlets' defence to score, with Humphreys converting. Ulster continued to press but the hosts held out and a Priestland penalty stretched their lead to 15-7. Moments later Ulster tight-head Declan Fitzpatrick was sent to the sin bin following another collapsed scrum with 15 minutes to go, but despite being down to 14 men Ulster fought back. Wing Tommy Bowe broke through the Scarlets defence, but Cave could not hold on to what would have been a try-scoring pass. Pienaar kicked two penalties, one from close to halfway, in the space of three minutes to cut the deficit to only two points, but missed a third kick on 76 minutes which would have given his side the lead. And with time running out, flanker Davies intercepted the ball from an Ulster scrum to score a converted try underneath the posts to clinch victory. Scarlets: Liam Williams; Kristian Phillips, Regan King, Scott Williams (capt), Michael Tagicakibau; Rhys Priestland, Rhodri Williams, Rob Evans, Emyr Phillips, Samson Lee, George Earle, Johan Snyman, Aaron Shingler, James Davies, Rob McCusker. Replacements: Kirby Myhill, Wyn Jones, Rhodri Jones, George Earle, Rory Pitman, Aled Davies, Steven Shingler, Hadleigh Parkes. Ulster: Louis Ludik; Tommy Bowe, Darren Cave, Luke Marshall, Craig Gilroy; Ian Humphreys, Ruan Pienaar; Callum Black, Rory Best (capt), Declan Fitzpatrick; Dan Tuohy, Franco van der Merwe; Robbie Diack, Clive Ross, Roger Wilson. Replacements: Rob Herring, Andrew Warwick, Bronson Ross, Alan O'Connor, Mike McComish, Paul Marshall, Michael Heaney, Michael Allen.